If you have said or heard any of these complaints, you know you aren’t the first one. But did you know there are at least 160 years of complaints similar to them? Omaha was slow to pave its streets. Founded in 1854, the first street paving in the city didn’t happen for a decade, and even then was only downtown and was only made of wood. Omaha was a dusty and muddy big town for a long time. When the city did begin paving, they used all kinds of things. Before 1890, streets were covered with blocks made from cypress and cedar trees, Galesburg brick, Woodruff sandstone, Colorado sandstone, Sioux Falls granite, and asphalt. That year, the City of Omaha got serious about covering the old dirt roads that made the grid then. However, it took them a long time. This shows Cuming Street shooting west from North 30th Street, past Tech High and towards the Northwest Radial Highway. Cuming Street was expanded to carry highway-type traffic in the 1950s. American Indian tribes moved freely throughout North Omaha for thousands of years before Europeans showed up. Their hunting paths are long gone, but by following the geography of the land its easy to guess that the earliest roads made by Europeans followed those trails. For instance, the Florence Boulevard travels along the top of a ridge, which is where tribes may have had a hunting path. 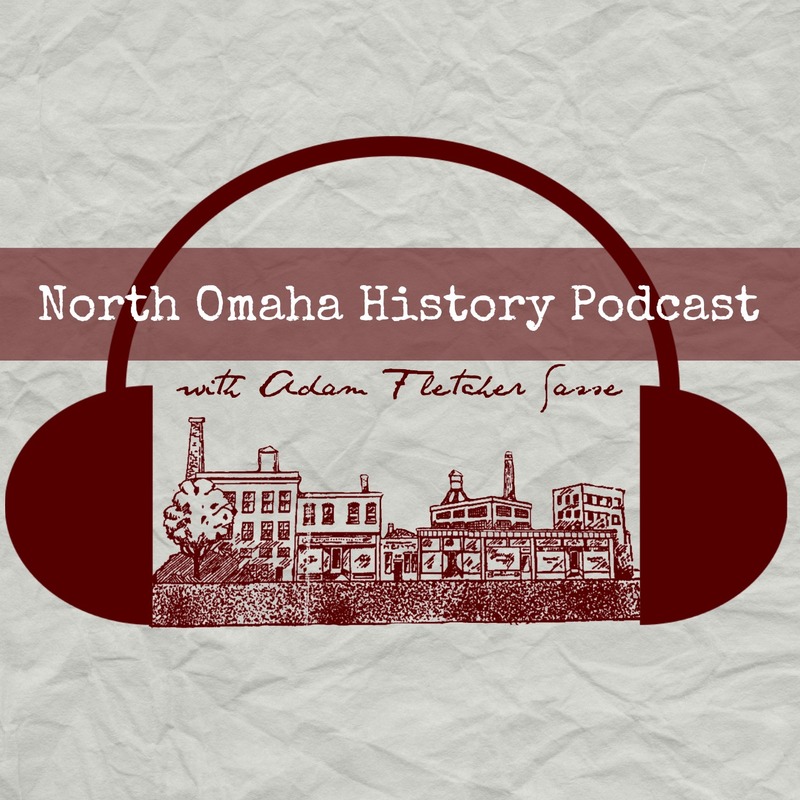 The first roads in North Omaha made by Europeans and European Americans generally went through the area to somewhere else. The Whitman Trail, which was the precursor to the Oregon Trail, crossed the southern part of North Omaha along present-day California Street. Manuel Lisa, a Spanish fur trader for a French company, had a fort in North Omaha which surely had trails to it that have been lost to time. The grand entry of European road-making in North Omaha, though, is clearly defined. Although their first effort called Cutler’s Park was a bust, the Mormons made a massive contribution to the design of the area by using a grid-pattern to lay out their town of Winter Quarters in the Indian Territory that became Nebraska in 1846. The street names in their town included Cutler, Cahoon, Pratt, Woodruff, Russel, Smith, Joseph, Hyram, Carlos, Spencer, Hunter, Eldrege, and Chase Streets. These streets ran east to west from the Missouri River, while the two north-south throughfares ran for a mile parallel to the the river, and were called First Main Street and Second Main Street. This is the 1846 map of Winter Quarters made by its settlers. It clearly shows each street in town. Other early roads in North Omaha included Winter Quarters Road, which became Florence Boulevard; Saunders Street, which became North 24th; Sherman Street, which became North 16th; and Ames Avenue, which was originally Commercial Street in the Town of Saratoga. Another road from Saratoga became Carter Boulevard, including its infamous Dead Man’s Curve. There were also roads to other early small towns, including Briggs and DeBolt. All of these were eventually absorbed into the City of Omaha’s street grid, and their historic appearances (names, curves, etc.) disappeared. It took a long time for the streets in Omaha to get paved. 1885 and 1856 maps showing the Military Road through Omaha, including modern street names in brackets. After the Mormons laid out the first streets in North Omaha, in 1850 the US Army laid the first major formal road through the area. Today we call it Military Road, since it was made to move supplies to the military forts and posts in western Nebraska. The Overland Trail hauled over the same route in the 1860s, widening the road and ensuring its longevity. Arriving in Omaha from Fort Kearney at present-day Nebraska City, the road originally came north to present-day North 24th (Saunders Road) and Cuming Street. The original route of Military Road in Omaha went from Saunders Road (North 24th) to North 30th, northwest up present-day Oregon Road to Parker Street, and southward to Hamilton Street. From there it went to present-day Military Avenue, which then moved along what we know as the Northwest Radial Highway now. As it becomes Military Avenue again, it went toward Fremont. Today, there is a historic segment of the old Military Road on the National Register of Historic Places. Located near North 82nd and Fort Streets, its cobblestones carried farmers from the countryside into Omaha, and once again travelers to western Nebraska. Early Omaha wasn’t a progressive place filled with Victorian-era civic-minded boosters who wanted to make everything beautiful for everyone. Instead, it was a scruffy and determined pioneer profit center where goods were stored to stock the wagon trains that populated the western territory of the United States. Because of that, it took more than 25 years after the city’s founding to get serious about paving the streets. This Google Earth image shows the last exposed streetcar tracks in North Omaha, located at North 29th and Lake Streets. In 1880, the city had 118 miles of streets and supposed only half of these were paved until 1883. In North Omaha, North 24th Street was paved in Cedar blocks in 1890. That year, Spaulding was paved with the same from North 24th to the Belt Line Railway. Bristol was paved with brick from North 24th to North 30th Streets. Further south, Grace Street was paved with granite from North 24th to North 16th Street, and with sandstone from North 16th to North 14th. Wirt, Lake and Clark Streets were paved with Cedar blocks from North 24th to North 16th. At the same time streets on the north end of Omaha were getting paved, there were streetcar tracks being installed throughout the community. Originally pulled by horses, the more popular electric streetcar tracks eventually won out. The companies would basically come along, remove all the paving for a street along the tracks’ route, then replace the paving after they were finished. Pictured above are tracks on North 29th Street, which was the original north-south route instead of North 30th, south of Ames Avenue. That was obviously later corrected. Before 1890, almost nothing else north of Spaulding was paved. North of Cuming Street, nothing west of North 24th Street was paved, except for Cuming, which was paved privately all the way from North 16th to North 40th by Samuel Mercer for his Walnut Hill neighborhood. The vast majority of streets in North Omaha were dirt roads in 1890. Brand new developments, single homes on small spreads, and the small number of businesses were all on dirt roads. This 1890 paving map shows (from top) Izard, Cuming, Burt, Webster, California, Cass, Chicago, Davenport, Capitol and Dodge Streets; from 8th to 24th Streets. The reference key on the left shows what type of paving the streets had. In 1890, the Omaha City Council started prioritizing street paving. However, they weren’t particularly fast or determined about it. Instead, they plodded along and paved where they wanted to, as they wanted to. Although citizens complained, there wasn’t a lot of progress. 15 years later, little progress had been made. According to a paving map from that year, the most substantial progress was made on North 16th, which was paved from Dodge to Fort with asphalt and stone. North 30th was paved from Bristol to Florence with brick, stone and macadam, which was tar-covered gravel. North 20th Street was paved in brick from downtown north to Lake Street. North 24th Street was asphalt from downtown to Lake Street and brick from Lake to Ames Avenue. Near that intersection, Commercial Avenue was paved in stone, but Ames Avenue was still dirt. By this point in 1905, the only streets between 16th and 24th that had any paving on them were Nicholas, Paul, Clark, Grace, Lake, Corby, Binney, and Emmet Streets. They had a variety of surfaces, including wood block, sandstone, and granite. West of 24th and north of Dodge, the only east-west streets with any paving were Cuming, parts of Burt, Hawthorne Avenue in the exclusive Bemis Park neighborhood, Parker, Bristol, Evans, Spaulding, and the intersection of 30th and Ames. These were also covered in a variety of surfaces, with wood being the most popular. The only exception was North 40th, which was paved in asphalt from Dodge to Hamilton Street, then Hamilton to Military was covered in brick, and Military Avenue was covered in brick and stone to the city limits at North 48th Street. 110 years ago, all of the rest of Omaha was covered by dirt roads. Instead of gravel and cracked avenues, the main features of North Omaha’s streets were mud ruts, snow-covered drives, grass-covered lanes and holes big enough to hold pots. There are many ways streets are referred to in North Omaha. Looking north on North 16th from Nicholas Street in the 1910s. In the distance are the Mother’s Flour silos, with the Storz brewery behind them. Every roadway in Omaha is governed by the City government, and they dictate how and why particular types of streets exist. According to City of Omaha ordinances, when the word “Circle” is used, it refers to a street that’s a cul-de-sac, a dead-end street or a street that has its entrance very close to its exit. The City uses the word “Parkway” for a street that carries noncommercial traffic with extensive landscaping. “Boulevard” is used for streets and rights-of-way that are part of the Omaha Park System. The word “Drive” is for streets that are curvy and don’t fit the normal east-west or north-south pattern. A “Court” is the name for a thoroughfare or access road that is not a public right-of-way but has the same alignment and characteristics as a public avenue. At one point in Omaha history, being an “Avenue” meant that a roadway was wider than usual, and was supposed to be tree-lined. Being a “Street” meant that the roadway was designed for efficiency. Streets were supposed to have limited parking and stop signs; avenues were supposed to be for parking and signage, relaxing all driving. This prescription didn’t prove accurate though, and the system was abandoned. Street—Connects multiple points; below 35 mph. In North Omaha, these can also be unimproved or substandard, covered with asphalt, concrete, gravel or dirt. Avenue—Connects multiple points; below 25 mph. Usually only runs north-south. Boulevard—A street with a median down the middle or on both sides; likely part of Omaha’s official Boulevard System. Road—Will usually be unimproved or substandard, covered with asphalt, concrete, gravel or dirt. Drive—Often looping, winding or otherwise not straight. Can be very long; often short and only in one neighborhood. Lane—Often a limited distance, and frequently leading to a private driveway. Circle—Also called a “cul de sac”, it ends in a small circle or loop. Expressway—Two or more lanes on each side, no tolls, with limited intersections, cross streets or traffic lights. Parkway—Two or more lanes on each side with a planted median and sidewalks with trees; no tolls, with limited intersections, cross streets, and traffic lights. Alley—A narrow road between houses and buildings connecting streets; not always driveable; generally poorly kept in North Omaha. In 1889, the City of Omaha planning commission decided to get serious about establishing parks throughout the city. Horace Cleveland, a nationally popular landscape architect, was hired to develop the plan, and North Omaha benefitted a lot from his work. Today, more than 125 years later, several winding, tree-lined boulevards still grace the community. City of Omaha Planning Commission “Plan Showing Proposed Inside Boulevard System and Boulevard Extensions” from the 1920s. The first and most renowned piece of the puzzle was called The Prettiest Mile in Omaha Boulevard. Its graceful, wide roadways were lined by long lawns and flower-bedazzled medians which split north-south traffic into different lanes. Homes along this stretch were sold as part of the Norwood Addition, and maintain much of their behemoth beauty. Today, this section forms the northernmost stretch of Florence Boulevard between the Storz Expressway and Reed Street. Florence Boulevard extends southward through the beautiful Kountze Park neighborhood, and goes downtown along North 20th and North 19th Streets. Other boulevards in North Omaha include Lincoln Boulevard, which was named after Abraham Lincoln. It runs through the Bemis Park neighborhood east-west from North 33 Street to Mercer Boulevard. Mercer the connects to the John A. Creighton Boulevard, which was named after the city’s famous banker and runs south-north from Mercer Park through the Pleasant Hill neighborhood north and east through Adams Park. It merges into Paxton Boulevard at Sprague Street, which was named after the Omaha industrial tycoon. Paxton then melds into Fontenelle Boulevard, which goes through the park of the same name and towards Benson. Looking east on Belvedere Boulevard towards Miller Park in the 1910s. In the far-north section of the community, the John J. Pershing Drive Named is named after a famous World War I general. It runs south-north from East Omaha from Abbott Drive at North 16th Street, then between the river and Florence, under the Mormon Bridge past Dodge and Hummel Parks, finally ending at Ponca Road. Originally part of a 1915 “back-to-the-river” plan in which a boulevard would follow the entire length of the Missouri River from North Omaha through Downtown to South Omaha. The Florence Boulevard, mentioned earlier, was designed to connect to Minne Lusa Boulevard, which criss-crossed Miller Park on the old Birch Drive and connected to Belvedre Boulevard. That strip carried cars to Fontenelle Boulevard. The Carter Drive extended from Florence Boulevard, shooting towards Cornish Boulevard to wind into Omaha’s Levi Carter Park. All of these boulevards were originally part of a plan to tie together North Omaha’s beautiful parks, including Kountze, Adams, Miller, Carter Lake and Fontenelle, with other parks and boulevards throughout the city. Many of them still serve that purpose, and although some have been altered, many still maintain the vision H.W.W. Cleveland laid out in 1889. In the 1910s, the City of Omaha entertained an ambitious plan to build a 19-mile-long River Drive that would connect Omahans with the Missouri River. Although it was never fully completed, there is a remanent of the test section between the J.J. Pershin Drive and the Missouri River, as well as a section that was completed north of the Mormon Bridge to Ponca Road. Other notable additions to the system that weren’t part of the historic plans are the Abbott Drive, which was paved in the 1950s, and the Sorenson Parkway, which was completed in the 2000s. This is Florence Boulevard by Miller Park in the 1920s. After the Mormons settlers of Winter Quarters left the area in 1847, the town had a few residents left. However, it was in the 1850s that James Mitchell acquired the property and launched a town named after his daughter. While he established new street names, he also created plans for a new bridge to span the Missouri River. A bridge company was formed, but nothing was built under their watch. It wasn’t until 1936 when it was attempted, but that didn’t work. In 1952, the first span of the Mormon Bridge was finished, and in 1975, the second. It operated as a toll bridge until 1979. The bridge continues to operate today. This is a pic of the Locust Street Viaduct, looking west towards the intersection of North 16th and Locust Streets from 11th Avenue. The Locust Street viaduct was an important roadway in North Omaha for several decades. Built between 1916 and 1918, the viaduct extended from North 14th Street to North 11th Street. Carrying traffic from North Omaha to the Carter Lake area, the viaduct traversed over the Missouri Pacific Railroad, which headed to a roundhouse in this area. In 1990, a train hit one of the upright supports for the viaduct, smashing the train and making the viaduct structurally unsafe. It was torn down shortly after, and replaced with a regular roadway. There was a railroad trestle over North 16th Street at Commercial Avenue to prevent traffic from being stopped with the Missouri Pacific Railroad which crossed there at one point. It was removed in the 2000s. Cuming Street at North 25th, looking west towards the Robert’s Dairy and Tech High School. According to the City of Omaha, the Public Works Department does street repairs, snow removal and street sweeping on more than 4,500 miles of streets. Some of the east-west streets include the following. Dodge Street was named for politician Augustus C. Dodge. Capitol Avenue was named for Capitol Hill, site of the Nebraska Territory Capitol. Davenport Street was named for Davenport, Iowa. Chicago Street was named for Chicago, Illinois. Cass Street was named for politician Gem Lewis Cass. Cottage Grove Avenue was a general name with no meaning. California Street was named for the state of California. Webster Street was named for politician Daniel Webster. Decatur Street was named for Stephen Decatur, who nobody apparently knows much about. Burt Street was named for politician Francis Burt. Bemis Street was named for politician, businessman and landowner George Bemis. Cuming Street was named for politician Thomas B. Cuming. Lincoln Boulevard was named for president Abraham Lincoln. Izard Street was named for politician Mark W. Izard. Hawthorne Street may have been named for author Nathaniel Hawthorne. Nicholas Street was likely named for the pioneer-era Nicholas Hotel. Indiana Street was named for the state of Indiana. Western Avenue may have been named for the direction it was heading. Caldwell Street was named for businessman and politician Smith S. Caldwell. Lafayette Avenue was named for a French hero of the American Revolutionary War, the Marquis de La Fayette. Hamilton Street was named for businessman and politician Charles W. Hamilton. Underwood Avenue was named for businessman W. A. Underwood, who built the Florence Water Works. Fontenelle Boulevard was named for Logan Fontenelle, a leader of the Omaha Nation. Florence Boulevard was named for the Town of Florence. Charles Street was also named for businessman and politician Charles W. Hamilton. Seward Street was named for lawman H. L. Seward. Franklin Street was likely named for Benjamin Franklin. Clark Street was either named for businessman S.H. Clark or military leader and explorer William Clark. Lizzie Robinson Avenue was named for a religious leader. Patrick Avenue was named for landowner J.N.H. Patrick. Yates Street was named for businessman Henry W. Yates. Burdette Street was named for writer, speaker and clergyman Robert Burdette. Grant Street was named for president Ulysses S. Grant. Victor Avenue may have been named for newspaperman Victor Rosewater. Erskine Street may have been named for the town of Erskine, Scotland. Willis Avenue may have been named for businessman Richard Willis. Sherwood Avenue may have been named for the Sherwood Forest in England. Cady Avenue may have been named for politician Addison E. Cady. Lake Street was named for was named for lawyer, judge and landowner George B. Lake. Ohio Street was named for the state of Ohio. Miami Street was named for the city in Ohio. Corby Street was named for politician and builder Joseph O. Corby.Joseph O. Corby. Locust Street was named for the species of tree. Maple Street was named for the species of tree. Binney Street may have been named for politician Horace Binney. It was also called Cassius Street. Blondo Street was named for fur trader Maurice Blondeaux. Wirt Street may have been named for politician William Wirt. Spencer Street may have been named for businessman E. R. Spencer. It was also called Cameron Street. Bedford Avenue was named for politician, businessman and landowner Jefferson W. Bedford. Bristol Street may have been named for the town of Bristol, England. John J. Creighton Boulevard was named for a businessman and civic leader. Saddle Creek Drive was named for the creek it covered up. Lothrop Street may have been named for politician George Lothrop Rouse. Emmet Street was named for Irish political leader Robert Emmet. Birch Street was named for the species of tree. Pinkney Street may have been named for statesman William Pinkney. Evans Street may have been named for businessman John H. Evans. Pratt Street was named for politician Augustus Pratt. Manderson Street was named for lawyer and politician Charles Manderson. Laird Street may have been named for politician James Laird. Spaulding Street was named for politician and educator S. K. Spaulding. Ruggles Street was named for military leader George D. Ruggles. Commercial Avenue was an originally named street in Saratoga, Nebraska Territory. Sprague Street may have been named for military leader John W. SpragueJohn W. Sprague. A. V. Sorensen Parkway was named for politician and businessman Axel Vergman Sorensen. Northwest Drive may have been named for the direction it was heading. Abbott Drive was named for businessman Chris J. Abbott. Paxton Boulevard was named for businessman William A. Paxton. Sahler Street was named for judge John H. Sahler. Boyd Street was named for politician, civic leader and businessman James E. Boyd. Cornish Boulevard was named for politician, businessman and landowner Edward J. Cornish and his wife, Selena. Taylor Street was named for businessman E. B. Taylor or for president Zachary Taylor. Ames Avenue was named for businessman and landowner Oakes Ames. Meredith Street was named for lawyer, politician and businessman John R. Meredith. Templeton Street was named for businessman W. G. Templeton. Carter Boulevard was named for businessman Levi Carter. Grand Avenue was originally called Goodwill Avenue, which was named for politician Taylor G. Goodwill. At different points, it was also called Grant, Tuttles, Park and Irey Avenue. Redman Avenue was named for politician and education leader Joseph Redman. Saratoga Street was named for the Town of Saratoga. Browne Street was likely named for businessman Will Browne. Camden Street was likely named for the Borough of Camden in London, England. Fort Street was named for Fort Omaha. It was also called Garfield, Hagedorn, and Baker Street. Ogden Avenue was named for businessman W. B. Ogden. Jaynes Street was named for businessman H. S. Jaynes. Ellison Avenue may have been named for judge Andrew Ellison. Hartman Street may have been named for politician Chris Hartman. Himebaugh Avenue was named for civic leader and businessman Pierce C. Himebaugh. Arcadia Avenue may have been named for an area in Greece. Laurel Street may have been named for the plant. Ville de Sante Drive was named for the apartments it runs by. Crown Point Avenue may have been named for Crown Point, a town in New York. Minne Lusa Boulevard was named for the Minne Lusa Pumping Station. Stone Avenue was named for businessman E. L. Stone. Belvedere Boulevard was named for an architectural term belvedere, which is derived from the Italian phrase vista bella, meaning beautiful view. Kansas Avenue was named for the state of Kansas. Airport Drive was named for Eppley Airport. Orville Plaza was named for aviator Orville Wright. Nebraska Avenue was named for the state of Nebraska. Arthur C. Storz Expressway was named for a businessman. Curtis Avenue may have been named for military leader Samuel Ryan CurtisSamuel Ryan Curtis. Henninger Drive may have been named for architect F. A. Henninger. Vernon Avenue was named for the Vernon Heights addition it runs through. Redick Street was named for lawyer, politician, landowner, and judge John I. Redick. Martin Street was named for businessman Charles Martin. Bauman Avenue was named for businessman and landowner Otto Bauman. Oregon Trail was part of a northern connector to the regular Oregon Trail in the 1840s. In the mid-1850s, it became part of what is now called Military Avenue. Military Avenue was laid out by the US Army in the 1850s. It originally led from about North 30th and Dodge to join the Great Platte River Road, which meandered to join the Oregon Trail. Dock Street was named for the former site of a dock on the Missouri River. Whitmore Street may have been named for businessman E. E. Whitmore. Malcolm X Avenue was named for the civil rights leader. Country Club Road was named for the Omaha Country Club, which was originally located here. Iowa Street was named for the state of Iowa. Wyoming Street was named for the state of Wyoming. Girard Street was likely named for businessman Stephen Girard. Forest Lawn Avenue was named for the Forest Lawn Cemetery. Starlite Drive was named for the former Starlite Drive-In movie theatre. Craig Avenue was originally called Washington Avenue and was named in honor of president George Washington. Grebe Street was named for lawman, politician and businessman Henry Grebe. J. E. George Boulevard was named for businessman John Edward George. Mormon Street was named in honor of the original settlers of the area. State Street was named for the street of the same name in Chicago. Park Marina Street was named for the marina in Dodge Park. Bondesson Street may have been named for businessman John Bondesson. Fillmore Street was named for president Millard Fillmore. Howell Street may have been named for pioneer Henry Howell. Mormon Bridge Road was named for the Mormon Bridge. Bridge Street was named for the bridge planned to cross the Missouri River in 1856. Ferry Street was named for the former site of the Florence Ferry across the Missouri River. Hummel Street was named for government worker Joseph B. Hummel. Calhoun Road was named for politician John C. Calhoun. John J. Pershing Drive was named for a military leader. Sherman Avenue, now called North 16th Street, was named for military leader William Tecumseh Sherman. Saunders Avenue, now called North 24th Street, was named for politician Alvin Saunders. North 30th Street was once called North 31st Street and Second Main Street in Florence. Florence Boulevard was originally called Winter Quarters Road. There are more than a dozen major intersections in North Omaha. Some are historically relevant but have become unimportant; others have only grown and grown; and still others just exist. Their importance today varies by degree. In this listing, I will avoid the downtown area by starting at Cuming Street and going north to I-680; then going west to North 72nd Street. Some of these intersections are listed here. I know I’m missing some historically significant intersections – please share your suggestions with me in the comments section below! Some of the streets in North Omaha don’t have their original names anymore. Instead, they were named, renamed and rededicated several times over the years. Omaha’s Canal Street originally ran from approximately east to west from North 9th to North 15th; north to south from Yates to Seward. Thanks to Michele Wyman for identifying this location. It bisected Bowery Street, Aspinwall Street and Bright Street, and was just a block north of Blessington Street. Thanks to Michele Wyman for identifying this location. North Omaha’s Central Park neighborhood in the early 1880s, when the streets were clearly labelled with their original names. North Omaha’s Central Park neighborhood in the late 1880s, after some street names started changing. The area called Central Park today started out as a country intersection for farmers in the north and northwest parts of Douglas County. Today, the intersection of North 42nd and Grand Avenue barely shows any signs of having thrived. However, in its day there were businesses, a school, a church and more there. Given its once-remote nature, it should come as no surprise then that while Grand was once called Tuttle, there were also streets named 2nd, 3rd, 4th and 5th. Today, they are called Saratoga, Browne, Camden and Fort, respectively. Grand Avenue acted like a main street for this neighborhood. Two little stubs of Maple Street near North 16th were originally called Central Street. The streets around the old Immanuel Hospital are very clear on this 1940s era Sanborn Fire Insurance map. The Florence neighborhood once had several different street names, too, that were changed over the years as the town was integrated into Omaha’s street system. First Main Street and Second Main Street were some of the most distinct, and were laid out by the Mormon settlers in 1846. Starting with First Main Street by the cliffs next to the Missouri River, there were three other streets to the west, covering the tableland that the town sits on. While it seems like a community’s streets would become sacrosanct at some point, that hasn’t been the case in North Omaha. Instead, the City of Omaha has used the community as a drawing book where they could erase and rewrite streets and neighborhoods at will to suit their grandiose visions for the city. That’s meant the obliteration of neighborhoods, the demolition of A LOT of historical structures, and the erasure and reconfiguration of many streets throughout the years. One of the most controversial street projects in Omaha was the creation of the North Freeway. Originally envisioned as an interstate highway to connect I-480 with I-680, it was stopped more than two miles south of its pathway by resistant neighborhoods and political force. Instead of reaching north, it was connected by the new Sorenson Parkway and to the Storz Expressway. For a century, North 16th Street was one of the most important streets in Omaha. It was so important, it was renamed for one of Omaha’s heroes for many years. The original location of country estates and grand mansions, it gave way to swanky apartments and vital industries. Eventually it settled into suburban bliss. Another controversial and obviously discriminatory way that the City of Omaha used streets in North Omaha was the construction of the Hilton Hotel in downtown Omaha. Originally proposed as a mega-hotel that would be a boon to the city by bringing its hotel stock into the 20th century, the Hilton Corporation told city planners it would need a two-block section to create an effective footprint for its building. They blocked off North 16th Street. The 1960s riots in North Omaha scared white Omahans into believing their businesses, culture and security in downtown Omaha was in jeopardy. Rather than addressing the economic, social, educational and cultural stagnation brought on by white flight from North Omaha, the City’s leaders were bound and determined to enforce racial segregation. So, in a cynical and veiled attempt at placating their white constituents, Omaha’s white city planners walled off one of the three major roadways leading commerce into North Omaha. They used the Hilton Hotel to literally block traffic on North 16th. Today, more than 40 years later, that abomination still stands as a Doubletree Hotel, and North Omaha still suffers because of this white supremacist planning today. Real estate mogul George Bemis published this 1883 map of Omaha, which I’ve clipped to show North Omaha specifically. I’ve added yellow dashes to highlight present-day 16th, 24th, and 30th Streets; as well as Cuming, Hamilton, Lake, Locust, Ames and Fort Streets. The intersection at North 18th and Lothrop Streets shows its bricks in this pic by Michaela Armetta. The future of North Omaha’s streets is still being written. While its true there are a few brick streets left, its also true there are gravel streets throughout North Omaha, including in East Omaha, in the Saratoga neighborhood, and scattered around far North Omaha. That doesn’t sound very futuristic. In the meantime, the City and its redevelopment plans have destroyed some of North Omaha’s traditional grid pattern streets in the Near North Side neighborhood. Instead, they’ve installed cul-de-sacs in the neighborhood, awkwardly breaking up more than 100 years of positive patterns. Is this going to continue? Does the City want to eliminate North Omaha’s grid patterns? What’s the point of leaving a few brick-covered streets in North Omaha? General Ordinances Passed by the City Council of the City of Omaha from April 1890 to April 1891. This 1883 map by George Bemis shows North Omaha, with dashed lines representing major streets. This is a 1912 map showing the Omaha Boulevard System throughout the entire city. This is an 1860s map of Omaha City, showing that North Omaha was merely at Cuming Street and no further. Very interesting article on the Streets of North Omaha. I grew up in Florence, North Omaha. My mother’s mother was JessieKing Lonergan, before her marriage to DC Lonergan she taught at Florence Grade school on North 31st. Her father was Francis Morris King who was the Mayor of Florence. I was told that King Street was named after him. I’m pretty sure the Douglas County Historical Society has information on him, although I haven’t personally researched this my brother in law has. I couldn’t find specific info on King Street, Michael – sorry! Why are the b’s capitalized and not the W’s? that’s only going in reverse, pal.